The text reprinted here is based on award-winning translator Burton Raffel’s masterful translation of Don Quijote, which is consistent, fluid, and modeled closely on the original Spanish. "Backgrounds and Context" invites readers to explore the creative process that culminated in the publication of Don Quijote. Included are selections from works parodied by Cervantes (Amadis of Gaul and Orlando Furioso) and a portion of the spurious sequel to Part 1 written by Fernándes de Avellaneda. 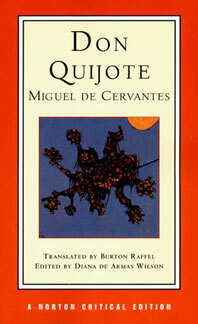 "Criticisms" presents fifteen major interpretations of both the novel and selected episodes, describing Cervantes’ intellectual milieu, revealing how he infused new life into the literary modes and motifs he had inherited, and illustrating the fundamental importance of Don Quijote in the history of modern fiction. Javier Herrero, Who Was Dulcinea?